I didn’t see shellers with buckets filled to the rim with seashells today, but I did see a few buckets that had nice quality shells that made every other sheller smile when they peeked into the bottom. This is Eddy’s bucket with that big FLAT SCALLOP and so mant color variations and sizes of the FIGHTING CONCHS and other goodies. I first met Eddy in August with his sister Rachael and they are back in full shelling mode. Look at those CONES Rachael found. This next bucket could make a grown shelling woman cry… I mean smile too. This is very impressive to see all of the KINGS CROWNS together in the bottom of this bucket, isn’t it? Molly found a secret shelling spot digging in some mud flats where she found all of these lovelies completely empty. Jack pot! This is KING’S CROWN queen Molly and her daughter Ella with their other best finds of the week…. SEA URCHINS, 8″ HORSE CONCH, ALPHABET CONES, SHARK’S EYES, ANGEL WINGS and a NUT MEG. Ella told me that shelling was her most favorite thing to do. Then a close second was rock climbing. Ella and her little brother Manny are excited to show off a few more shells.. a SUNRAY VENUS CLAM and a JUVENILE FIGHTING CONCH. The picture above are treasures that shellers Melody and Bill found on a day trip to Venice yesterday. Clockwise from the left … a KEY HOLE LIMPET, SEA GLASS, SHARK’S TOOTH FOSSIL and a TUSK shell all placed on top of a seagrape leaf. Nice finds! Happy Anniversary Melody and Bill! What a nice way to “Shellebrate”! There are still shells on the Sanibel side but the rip tide picked up a little this afternoon in between the shore and the sand bar… so be VERY CAREFUL if you are shelling around there. I’ve finally found all you crazy shellers like us so I don’t want to lose any of you! Beautiful!! Those crowns are very impressive! What is the shell that is in the first picture on the top, slightly right of middle. I’m not familiar with it..It is a bivalve, glossy and pretty brownish tones. And is that a turkey wing on the bottom of the same picture? I was supposed to be there Valentines week but have been taking care of elderly parents in VA and couldn’t make it, My boyfriend knows me well when he chose Sanibel for a Valentines get away. I have only been there one other time but had an amazing experience! I have photos of my shells on my screen saver and sometimes even dream I’m of shelling there! What a wonderful gift I have found thru my shelling experiences. I have introduced shelling to my grandkids but when they visit me in Myrtle Beach, SC they always say that they want to find the :”pretty, colorful” shells not the white ones. Haha. I will bring them to Sanibel and they too will be forever changed! Thank you for letting me enjoy this passion of mine thru you and your wonderful website! You are appreciated so much! I hope the good shelling continues for a while! For my birthday my husband gave me a trip to Sanibel! I haven’t been in 3 years and can’t be more excited. I will be down April 2-5 and can’t wait. Keep the great blog posts coming they are helping me hold on till I get there! That’s a calico clam on the top. 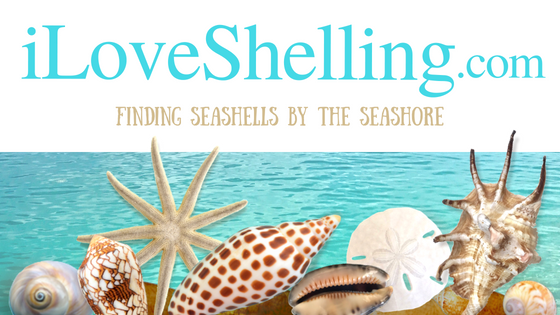 Check it out on my Shell Identification Page http://www.iloveshelling.com/blog/seashell-identification/ to make sure that’s the one you are referring to. And yes! That’s a turkey wing. That’s one I need to add to my identification page. Thanks! I really like the blue water in the last picture. Have a good weekend. I just have to comment that reading your posts is what is getting me through this brutal Minnesota winter (currently about 6 degrees out). We will be in Sanibel mid April and I can’t wait to sit on the beach and shell. My kids have never been there, hopefully they will like it as much as I do. Thanks for the great snippets of people’s adventures! Looking at all the great sheling is helping me get through this winter too. Today is 45 and raining like crazy. 28 days till I’m there! Can’t wait! Pam, you mentioned in the past that Clark uses a halogen flashlight. When I am going to be there it will be very dark at low tide. What are your thoughts on Halogen flashlights vs. LED flashlights? Is one better than the other for shelling in the dark? Those crowns are great. I’ve heard you can find them in the mud flats, but I don’t know where the mud flats are. We’re usually on the West Gulf Beaches. We always have a very hard time finding parking at Blind Pass, but we have had some great luck at the Lighthouse in the past. I bought our tickets for October yesterday… 225 days and counting!! love, love, LOVE all the little treasures. shark teeth, urchins, sea glass…thanks for sharing. I should send you a picture of my sand pails….they are full of SNOW! Impressive shelling from one of my favorite people and her adorable kids! Wow…she did hit the Kings Crown jackpot!! The water looks so pretty…my dream destination. I dream of shelling too, Barbara. Sheri what week are you going in Oct? I am planning a trip for then too. Havent picked out the dates yet. Maybe we can run into each other. We will be there from Oct 8-15 staying at Pointe Santo . Where are you traveling from? Pam, my kids were so darn excited to see themselves this morning! We had blast! I have found beautiful Kings Crowns on the gulf beaches – specifically the middle gulf areas during negative low tides. Did Eddy find a Green Tulip? It looks like it. WOW! Great find, kiddo! Molly, nice Kings Crowns and cute kids. I met Rachel & Eddy on Blind Pass while shelling through Tropical Storm #5. They are serious shellers! We will be travelling from Louisville KY. I am waiting on Southwest to open up their schedule for October and to pin down a travelling companion. Please email me as I would love to “chat” about our trips!!! I have only ever found one piece of sea glass on Sanibel. Great treasures! Impressive seashell collecting, I’m not so lucky to find such nice shells from where I live.